The third book in the Pellucidar (science) fantasy series. 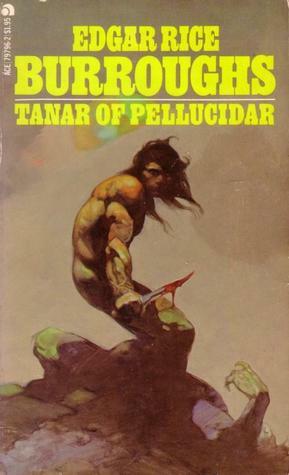 I read the first two Pellucidar books decades ago and clearly they’ve (also) left an impression because I remembered surprising much about them. Burroughs himself and a young man Jason Gridley, who is wealthy and a radio enthusiast, receives a strange radio signal. It turns out to come from the underground world of Pellucidar and from Perry, one of the two first Western man to find Pellucidar. He sends them the strange tale of Tanar. Tanar is the young son of a chief who is allied with David Innes who has declared himself the emperor of Pellucidar. However, Tanar was caught when the cruel Korsars raided David’s lands and when the Korsars sailed away, they took Tanar with them. The Korsar chief The Cid spares Tanars’ life because he believes that Tanar can show the Korsars how to make the more effective weapons that David’s men use. Tanar doesn’t know how to make them but plays along, hoping for a chance to escape from the ship. He meets The Cid’s lovely daughter Stellara who is destined to be the mate of The Cid’s second-in-command, an ugly but very strong man. She loathes him. However, a terrible storm drives all of the Korsars from the ship, leaving Tanar and Stellara behind. Stellara tells him that her mother was a captive from another island and that she’s really not The Cid’s daughter but that her mother’s original mate is her father. The ship drifts to an island which turns out to be Stellara’s mother’s home. However, the people there don’t believe Stellara and the two are again captured. By chance they are able to flee and Tanar tried to find a way home through dangerous country with hostile people. The book is mostly action/adventure although it does have Burroughs-style romance. That means jealousy, misunderstandings, and rivals. No less that three women declare their love for Tanar and Stellara, too, has four other suitors in addition to Tanar (most of them brutish louts). Almost the moment Tanar realizes that he loves Stellara, she’s kidnapped. Tanar’s people are cavemen but David has brought them better weapons. Still, Tanar mostly uses spears and bow and arrows. Many of the animals are prehistorical, such as saber-tooth tigers. In addition, we’re introduced to the Buried People, the terrible Coripies who live underground and have no eyes. They live very unhappy lives, filled with violence, just like another tribe of humans which Tanar meets. Yet, a woman are able to rise above her abusive culture and Tanara credits her blood for that; her mother was captured from another culture. Similarly, Tanar notes that Stellara doesn’t behave like the brutish Korsars because of her parents’ blood. Tanar is a native Pellacidarian and knows how to live in that world, of course. He’s mostly driven by desire to survive and later to find Stellara. He’s not eager to help other people, except when it’s in his own best interests. In that way, he’s different from most of Burroughs’ heroes. Stellara is a typical Burroughs heroine: proud and stubborn. She isn’t afraid to tell her opinions but she’s also liable to jump to conclusions, when given half a chance. She’s more compassionate than the Korsars which attracts Tanar to her in the first place. Yet, she’s helpless to fight against any of her kidnappers. Pretty standard Burroughs tale. It’s ends in a cliffhanger, but not for Tanar and Stellara. Poor David is left as a captive at the end of the book. The second book in the five-part Vatta’s War science fiction series. This book starts soon after then first book, “Trading in Danger”. After she was drummed out of military academy, Kylara Vatta, Ky, is now the captain of a small and old trade space ship. She survived her first voyage on it, but not without losses. Ky refuses to return to the arms of her family, the wealthy Vatta who have made their fortune through interstellar trade. Instead, she’s determined to make it on her own, no matter how boring it’s going to be. But then someone tries to rob her ship and she’s attacked in public. Someone has launched an attack against Vatta Transport Ltd. Their home is bombed killing many of the family members, including some very close to Ky. The attacks also sever interstellar communications, the ansibles. Furthermore, the government of Slotter Key is blaming the Vatta family and so shutting down their resources. Many of the other trading companies also feel that Vatta is to blame and refuse to deal with them. The surviving family sends one of the own to find Ky and to find out who their enemy is. Ten years ago, Stella made a grievous error and was branded as the family black sheep ever since. She’s the most unlikely person to investigate anything, so she’s sent. However, she’s a determined and level-headed woman. She has already learned to work undercover, as a spy of sorts, and now her skills are put to a test. Her former lover Rafe soon joins her. He’s a lovable rogue with plenty of talents and secrets of his own. Ky’s familiar cast returns. I enjoyed them more this time around although their attitudes towards Ky don’t change. She hires a couple of new men and while I could see what’s going to happen with (at least) one of them, it was still a nice ride. I also really enjoyed Ky and Stella’s interactions. However, Ky doesn’t really have time to mourn her family and the story has very convenient coincidences. This was a nice continuation to the series and definitely raises the stakes for Ky and the surviving Vatta family. Now, Ky has to work with no safety net which she had in the first book. 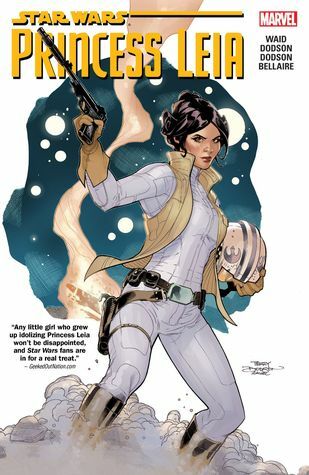 Collects Marvel’s Star Wars: Princess Leia issues 1-5. The comic starts right at the end of A New Hope. Leia has just given a very short eulogy to her own world, Alderaan, and her adoptive parents. One of the fighter pilots, Evaan, who is also from Alderaan, doesn’t like how cold Leia seems. There’s a large price on Leia’s head and the generals wants to keep her safe on the new base. Also, the Empire wants to round out all the surviving Aldraanians. But Leia has a plan of her own: she’s going to travel around and gather all the remaining Alderaanians and take them to someplace safe where they can continue their life style of peace and arts. To do that she needs to sneak off the Rebel base. She recruits the reluctant pilot Evaan and R2-D2. Some of the Aldraanians are happy to see their princess, but not all. And the Empire is dogging them at every turn. This was a nice quick read which moves at a decent clip. However, we don’t get any new insight about Leia. Which is fine by me, I enjoy reading about her anyway. But the ending was too abrupt and it’s clear that a mission like this isn’t going to be accomplished in just five issues. The story has a nice subplot about two sisters. We don’t actually know much about Alderaan through the movies. Just that it’s a peaceful place which doesn’t have any weapons. Yet, Leia is no pacifist: she fights right alongside the others and is clearly trained to use weapons. And since this is a Star Wars comic, there’s a quite a bit of fighting in the story line, in addition to sneaking around. The Alderaan in this comic is noted for arts. Many of the surviving Aldraanians are peaceful artists. But some of them are far from peaceful and defend themselves aggressively. A few of them are even traitors, so we get quite a variety of Alderaanins in the story. We also get a small glimpse into Leia’s childhood where she was reared to be a hereditary monarch. Her parents are shown as wise and respected, which we already knew from the prequels. Evaan is the other notable Alderaanian in the comic. As a fighter pilot, she’s clearly no pacifist, either. It was nice to see her development in the story. She starts with reluctantly honoring Leia because of her parents and status. Of course, this being an SW comic, you know that’s not the case at the end. Oh, I really like Dodsons’ art. It flows smoothly. However, the Dodsons have their own style with faces and Leia doesn’t look much like Carrie Fisher. 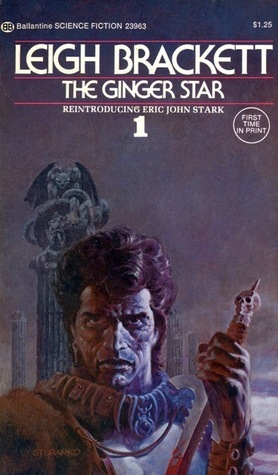 The third and final book in the Eric John Stark sword and planet trilogy. Another very nice Steranko cover but Stark still isn’t white. The previous book, the Hounds of Skaith, ended in hopeful tones because a starship captain had agreed to take Stark and his friends to the stars. But the captain, Penkawr-Che, was overcome with greed. He kidnapped Stark and Ashton, and demanded ransoms for the others. The story begins when the captain tortures Stark for information about a huge treasure trove of artifacts from Skaith’s ancient past. But Stark and his foster father Ashton manage to escape. The starship crews plunder nearby towns and temples while Stark and Ashton try to find another way to contact off-worlders. Meanwhile, the wise woman Gerrith and Stark’s loyal Northhounds are far away. But Gerrith has had a vision: they must reach Stark and Ashton before the duo reaches the sea. If not, Stark will die and Skatih is doomed. So, Gerrith and the few allies Stark have start a dangerous journey towards Stark and Ashton. We get to see again the places and peoples we saw in the previous books but somewhat changed. Again, Stark gathers allies where he can, even from former enemies. They know that one Wandsman has an off-word communications device and they must try to get it. We also see briefly how Penkwar-Che’s crew deals with some other familiar characters when Starks isn’t there to witness it. 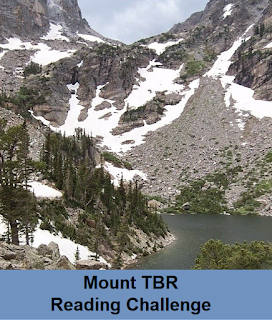 Also, the whole climate on the planet is changing: winters getting longer and harsher, summers shorter. This makes the people more ruthless and desperate. The book starts with three maps and glossaries of places, peoples, and characters. There’s also enough recapping to maybe start the story here but I recommend reading the previous volumes first. The Reavers of Skaith has more named female characters than either of the previous books. Some of them are only seen briefly but they all (except one) have life beyond their encounter with Stark. Interestingly enough, Stark’s foster father Simon Ashton often fills the role of a typical female romantic interest: the series starts when the Wandsmen have kidnapped Ashton and Stark comes to the planet to rescue him, and Ashton isn’t a warrior and has to rely on Stark to protect him. Ashton is an accomplished diplomat but rarely has a chance to use his skills on this violent planet. The Skaith trilogy is a very good sword and planet story with a satisfying ending. Stark is a relentless (and humorless) main character with deep loyalty to people he likes. He doesn’t trust easily and he doesn’t consider himself a civilized man. He also has to rely on his “beast side” to survive, especially with the hounds. However, there’s a brutality to the story, in the people, the environment, and Stark himself which makes this story feel very different from the light-hearted (if with a high body count) adventures in Barsoom. I wouldn’t want to read books like these all the time and I don’t think anyone would categorize these stories in the children section, as Barsoom books are now (at least here in Finland). 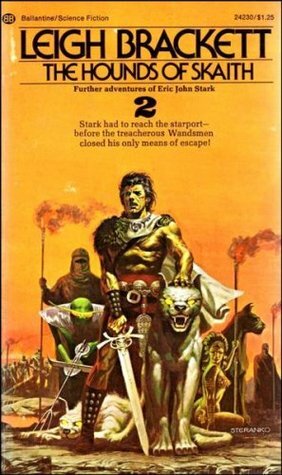 The second book in the Eric John Stark sword and planet trilogy. In the first book, the Ginger Star, former mercenary Eric John Stark followed his adopted father Simon Ashton to the planet Skaith which is at the fringes of the Galactic Union. The people on the planet don’t allow advanced technology, indeed many of them don’t believe that other planets exist, and so Stark couldn’t bring any with him. The local rulers, who don’t want new people coming to Skaith and giving the local oppressed people any ideas, kidnapped Ashton, and Stark had to fight his way to the Citadel where Ashton was held captive. Along the way, Stark made many enemies and a few allies. Now, Stark has reached Ashton and destroyed the Citadel, but the local rules, called the Lords Protector, have fled and taken some of Stark’s allies captive: the wise woman Gerrith and a wounded warrior Halk. Stark still has the nine huge Northhounds and with them and Ashton he follows the Lords Protector to the sandy but cold desert. Skaith has ruins of old, fallen civilizations and among them live many unhappy groups of humans. The planet also has near-humans who are apparently the results of genetic engineering long ago. The Wandsmen are the minions of the Lords Protector and rule over everyone. They also want to keep their power and so are enemies of Stark. The Hooded Men are in turn the Wandsmen’s minions intent on keeping their own power. The planet has also winged humans who control the winds, a group of people who live underground, and a couple of people who live in the sea. It also has Runners, people who are mostly skin and bones and apparently nearly mindless, just wanting to hunt and kill. The book has many big battles. Stark is grim and relentless in chasing his goals. At first, he wants to free his two friends but soon it becomes clear that he will have to plan big if he intends to keep all of them alive. So he does what he must. Even though the story is set on a planet and the first book had some planetary travel, Stark had to give up all of his advanced tech and the fighting is done hand-to-hand with swords. This gives a very archaic or fantasy feeling to the book. The fights are written very clearly, and now and then Brackett uses quite poetical language. But this a very harsh book; no humor at all and lot of violence. My favorite things in the book were the hounds. They live like wolf packs, led by the strongest hound. But they also obey the Wandsmen and can’t hurt them. Stark defeated the previous pack leader and now leads them like a hound. If he is wounded, the next strongest will challenge him. The hounds can send fear telepathically and then bring down their pray, no matter if it’s a man or an animal. Stark survived the fear sent to him because he’s not a civilized man; he was able to reach inside for strength to endure it. The hounds can also communicate with him and some others telepathically. The female characters are very much sidelined this time. Men decide the fate of their cultures through swords. The ending gives some closure but it’s clear that the story continues. A collection of seven science fantasy stories. Brackett’s introduction to the collection shows something of the science fiction field in the 1970s. She defends the need for space opera or purely entertaining stories which the critics apparently scoff. So nothing much has changed in my lifetime. She also introduces each of the stories and we get a fascinating glimpse into her own writing process; in 1945, at least, she seemed to have been a pure “pantser”; working without an outline or even an ending to aim for. She reveals how she came to collaborate with Ray Bradbury on the first story of the collection. 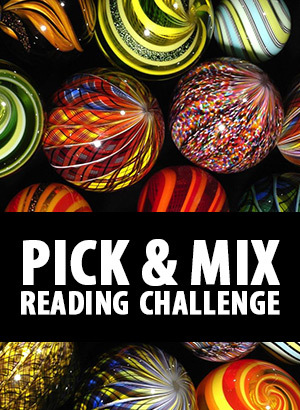 I was only familiar with Brackett, Bradbury, and Anderson before reading this collection. Hugh Starke (note that Stark/Starke name!) is a thief and a very successful one, too. This time he has robbed a million credits from the Terro-Venus Mines. He’s racing from the thugs the Mines sent after him, when his ship crashes. Starke wakes up and sees a strange, naked woman. Starke realizes that his own body is dying and the woman says that she will transfer his mind to another body. Starke wakes up again, this time in chains. It turns out that the body he’s given is one of swordsman Conan, who has betrayed his wife and his liege, in Crom Dhu. This is a fantasy tale set on Venus. Starke quickly becomes accustomed to his new body but finds himself a hated man. The strange woman, Rann, tries to control Starke’s actions for her own ends but Strake resents that and tries to make his own decisions. Professor Oberburger is a German scientist of rockets and other hard sciences. He lives now in Connecticut and, because he lives alone, talks to himself in a rather thick German accent. He has invented a new type of rocket and wants to send it to the Moon before revealing it to the scientific community. The only thing he can put in the rocket is a mouse which he names Mitkey (yes, after the famous Disney mouse). Poor Mitkey is stuffed into the rocket, with plenty of cheese, and blasted off. But something unexpected happens. This is quite a humorous and charming short story. Port Laribee is an Earth outpost on drying and dying Mars. A few people are attracted to Mars and work there as settlers but the work is hard. Joe Dayton came there as a young man with high dreams. Some years working there quench his dreams, but not his love of Mars. Then Frank Terry and his 10-year-old son Will come to the outpost, too. A year later, Frank is found dead but his son is missing and Joe is one of the people searching for him. I was very intrigued by the world-building in this story. The story itself is lyrical and haunting but for me the world-building was the best part. In this Mars, too, the civilization had died, leaving only ruins. There’s little oxygen but the vegetation remains and has gone mostly underground. Some of the plants are still on the surface and it’s possible to puncture holes into the plants and get air that way. Thig is part of a three-man exploration team. They’re looking for more planets for their race, the Horde, to conquer. His people are grown in laboratories and the only emotion they know is loyalty to the Horde. However, they also have a machine which can transfer one man’s memories (and emotions) to another’s mind. To find out more about Earth, they capture the first Earthman they see and Thig is ordered to take the Earthman’s memories and explore the planet. It’s easy because with little plastic surgery Thig looks exactly like the Earthman they captured. However, the man is happily married with children and family life affects Thig strangely. The Earthman is Lew Terry, a writer of Western tales. He’s struggling to write a new story. Unfortunately, the transfer of his memories kills him and so Thig takes his place in Lew’s family. Patrol Rocket One crashes on Venus, in an unexplored jungle. The scientists and military troops, 45 in all, have to walk hundreds of miles to their base camp, encountering all sorts of horrors on the way. Meanwhile, the men at the base camp are trying to think of a way to help them. 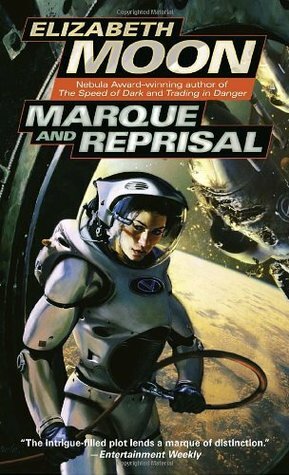 A horror/SF story where the military plays the central part. The main character is Lieutenant Hague who leads a group of infantry men. Bryan Barrett feels were strongly about social justice. He’s a writer and he brings to light the wrongdoing of the (US) government and big businesses. However, on man has convinced Bryan to go against his conscious. Bryan hates it but is persuaded by that man to become part of the news media which do their best to keep people uninformed. Bryan hates that man but has to endure a whole ten years of him. A short but very atmospheric story. Kreega is one of them original Martians; he even fought against the humans when they first conquered Mars a hundred years ago. A lot of things have changed since then: the Martians are no longer slaves but they’re very dependent on humans and their higher technology. Kreega is the last one still living in the harsh Martian wilderness. Riordan is an Earthman who has hunted every kind of big game – except a Martian. He knows that he might not get another chance, so he bribes a human official to look the other way when he goes to the wilderness, with a rockhound and a Martian hawk to run down the last true Martian. Another very atmospheric story set in a dying Mars. 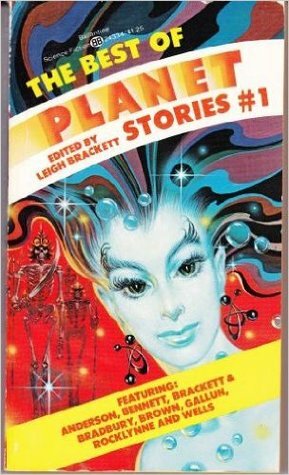 This is a marvelous collection to fans of pulp SF. The only piece I didn’t care for was Bennett’s; I’m not currently in the mood for horror so I might like it at some other time. Sadly, it seems that no further volumes were published. The first book in a science fantasy series. 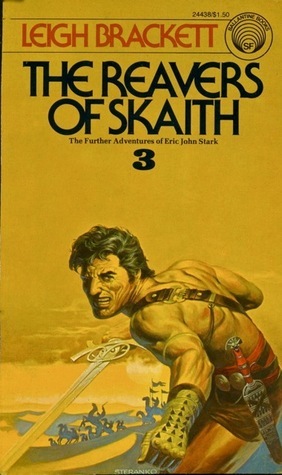 Brackett’s pulp hero Eric John Stark returns. His parents are from Earth but he spent his childhood on Mercury. After his parents died, a native tribe adopted and raised him, and he doesn’t consider himself a civilized man. After his foster parents were killed, Simon Ashton took the young, barbaric Eric in. Ashton works for the galactic government and now he’s missing. He went to a newly found planet, Skaith, and hasn’t been heard from since. Stark goes after him. Much like Brackett’s Mars, Skaith is also an ancient, dying planet where the current people live among the ruins of old civilizations, killing and robbing each other. Off-worlders aren’t welcome and are confined to stay in just one of the city-states. Indeed, most of the population has trouble with the whole concept of other people living on other planets. Some of them consider the whole idea blasphemy. However, when Stark finds out that the local equivalent of law, the Wandsmen, have taken Ashton, he’s determined to search the whole planet if need be. Much to his surprise, he hears that he is now the focus of a local prophesy: he’s the Dark Man who will destroy the Lords Protector and lead people away from Skaith. But the mythical and tyrannical Lords Protector and their Wandsmen want to stop anyone from leaving Skaith. Stark must defend himself from constant attacks while looking for Ashton. Some locals could be allies but can he trust them? The Ginger Star is a grim book. The people on Skaith are oppressed by the Wandsmen and by their own limiting beliefs. They’re often hungry and cold. The Wandsmen’s minions are the Farers who keep the other people in check with violence. The Farers are often naked and don’t do any other work. The planet has several humanoid races which are apparently results of human groups inbreeding too much and/or genetic engineering. The children of the sea live in waters and have gills. They’re also cannibals and make any use of water very dangerous. The human groups practice human sacrifice. Some throw sacrifices to the sea creatures, other sacrifice humans to the Old Sun. The book has several named female characters. They all have lives away from Stark and some have even high social standing. Almost all of them are naked when we meet them. After Stark lands on Skaith, we don’t see much use of science. His weapons are taken away so he has to use knife and sword and his bare hands to fight. This is a fast-paced book and a good addition to the pulp genre. Considering the shortness of the book, the world-building is amazing. Again, people aren’t described much but the places and the setting is vivid. It doesn’t end in a cliffhanger but it’s definitely not the end of Stark’s adventures on Skaith.